Before we get on with this Sunday's update, please welcome our newest developer, Stubbfan, who will be responsible for exporting all of the content created by our 3-D art department, into the world of FH2. 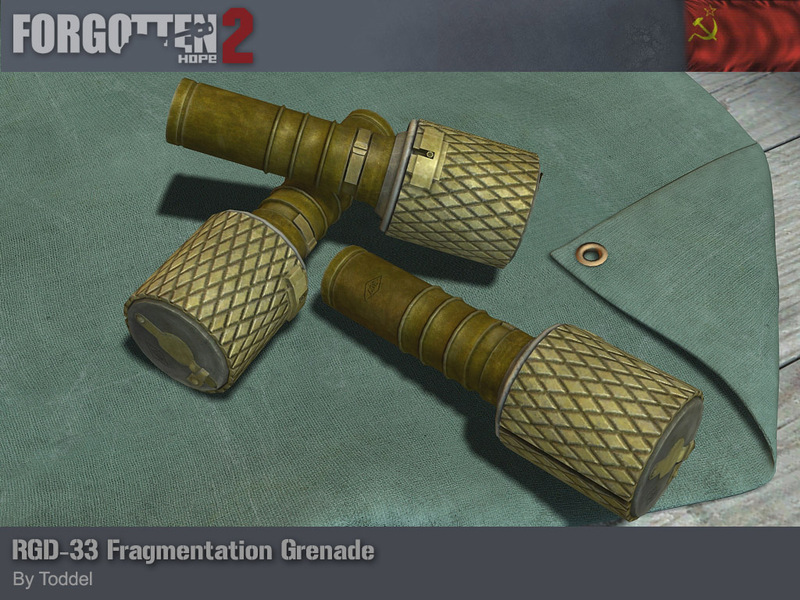 This week we have a render of something that no Soviet infantry soldier should be without; the RGD-33 grenade! The RGD-33 was a Soviet, anti-personal hand grenade that was developed in the early 1930s, with the primary intention of replacing the older, Model 1914 grenade. Weighing in at only 500 grams, the RGD-33 could be thrown between 30 and 40 meters, where it would then explode with a relatively small blast radius of 10 meters. One of the more unusual features of the grenade was the 250 gram metal fragmentation sleeve, which could be fitted around the top. When this was done, the grenade had a blast radius of 15 meters, and would send out heavier, diamond-shaped fragments. The RGD-33 was complex to manufacture and use, and despite its extensive use, it was slowly replaced by the simpler RG-42 grenade, after the German invasion. The RGD-33 hand grenade was made by Toddel. Our winner for this week's screenshot competition is AdeQ-187. You can view the winning submission here. We are now accepting entries for the week of Oct. 16th. If you think you have the best FH2 screenshot, post them here.